Utility and Corporate Bond Trust Inc.
Duff & Phelps Utility and Corporate Bond Trust Inc. (the "Fund"), a diversified closed-end investment company, first offered its common stock to the public in January of 1993. The Fund's investment objective is high current income consistent with investing in securities of investment grade quality. DUC utilizes a bank loan to leverage the common stockholders’ investment. The Fund seeks to achieve its investment objective by investing substantially all of its assets in a diversified portfolio of Income Securities. As used in the Fund's prospectus, Income Securities consist of Utility Income Securities, Corporate Income Securities, Mortgage-Backed Securities and Asset-Backed Securities (each as defined in the prospectus). In normal market conditions, at least 80% of the Fund's total assets will be invested, in the aggregate, in Utility and Corporate Bonds, and at least 25% of the Fund's total assets will be invested in Utility Income Securities. Dividends are currently paid monthly. Common Stockholders are automatically enrolled in the Fund's Dividend Reinvestment Plan, under which distributions of dividends and capital gains will automatically be reinvested in additional shares of Common Stock, unless an election is made to receive such distributions in cash. At the time of purchase, such an election may be made by giving written notice to the Plan Agent. Common Stockholders who intend to hold their shares through a broker or nominee should contact such broker or nominee in order to opt out of the Dividend Reinvestment Plan. For more information, contact Computershare Trust Company, N.A. at (866) 221-1681 or www.computershare.com/investor. Street-name shareholders should contact their financial adviser or broker. This information does not represent an offer, or the solicitation of an offer, to buy or sell securities of the Fund. 2Percentages based on total investments rather than total net assets. The portfolio is actively managed and subject to change. 3The ratings issued by Nationally Recognized Statistical Rating Organizations assess the credit worthiness of a corporation’s or government’s debt issues. The ratings apply to the Fund’s holdings and not the Fund itself. The lower rating of Moody’s Investor Service, Inc. or Standard & Poor’s Financial Services LLC is used. If a particular security is rated by either Moody’s or S&P, but not both, then the single rating is used. If a particular security is not rated by either Moody’s or S&P, a rating from Fitch Ratings Ltd. is used, if available. Ratings are subject to change. AAA, AA, A, and BBB are investment grade ratings; BB and below are below-investment grade ratings. Daniel J. Petrisko, Executive Managing Director, is the Head of the Portfolio Solutions Team at Duff & Phelps. He is responsible for oversight and management of institutional and retail fixed income and passive equity products, in addition to leverage financing for the Duff & Phelps closed-end funds. 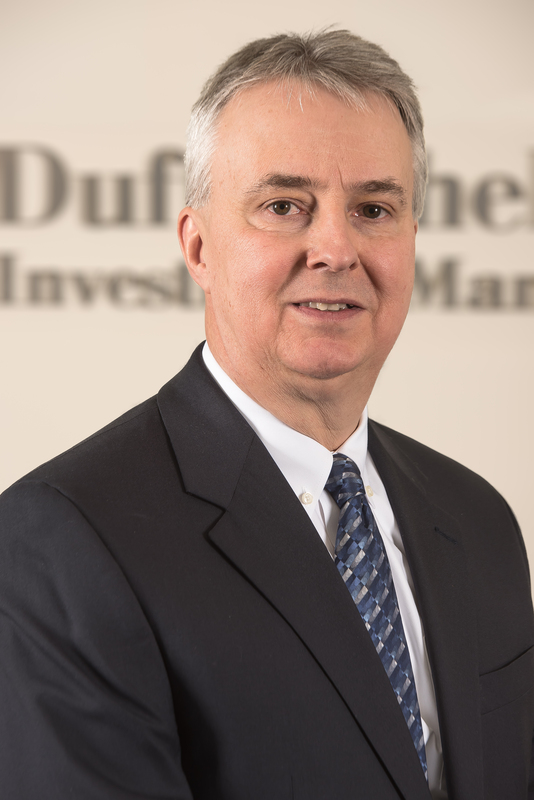 Mr. Petrisko serves as the Chief Investment Officer of Duff & Phelps Utility and Corporate Bond Trust Inc. and the Fixed Income Portfolio Manager of DNP Select Income Fund Inc. Prior to joining Duff & Phelps, Mr. Petrisko held positions in the Treasury and Investment areas of Citibank. Mr. Petrisko holds a BA degree from St. Xavier University and an MBA degree from DePaul University.